All licensed EMS Providers including instructor coordinators (IC) and EMS Dispatchers must have continuing education in order to relicense. 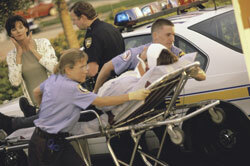 The relicensure period of EMS providers and IC's is three (3) years. For EMS Dispatchers it is (2) years. Continuing education leading to relicensure can be accomplished by two main methods. The first is by successfully completing the required Refresher Course for the specific license level. The second way is to accumulate the required number of CEH credits in the prescribed categories for the license level. Click here for a matrix of CEH Credit Hours by license level. This page gives you the opportunity to check the license and continuing education status of your EMS license. By entering your license number in the space below, you will be provided with basic information about your license and the list of CEHs which we have on file as of the date posted. CEH credits that are currently available, but which will expire before the license is due for renewal, are shown with an asterisk (*) on the report. Please be aware that there are many standardized educational programs (e.g. CPR, AVOC, PALS, ACLS, PHTLS, etc.) that have been pre-approved by Maine EMS and will not appear in this listing of individual CEH programs. Credit for attending these standardized programs will be applied at the time of relicensure upon submission of current course completion certificate(s).